These are really wonderful poems for older children. Some are funny, some are poignant, and some are truly heartbreaking and not suitable for very young kids. This poetry book has a wonderful premise: the first half of the book has poems of apology and the second half are poems of forgiveness (or not) in response. I had to look back a couple of times to match them up properly, but most were memorable enough to not have to do that. I loved these poems, and it would make a wonderful class project for this (sixth grade) age group. Through this collection of poems, the reader catches a glimpse into the way that children think and feel, at least through the eyes of the author, Joyce Sidman. The first half of the book consists of a collection of short poems written by the imaginary class of teacher, Mrs. Merz. These poems express words of apology for a variety of "offenses" such as getting carried away in a dodgeball game, stabbing a sister with a pencil, and breaking garage windows - to name a few. The second half of the book consists of a collection of "forgiveness poems" written by those who were "offended" by the children. Among the writers are a hamster who forgives his small owner for catching him and returning him to his cage, a mother who forgives her daughter for breaking a special Christmas ornament, and a school secretary who offers forgiveness to a little boy who steals jelly doughnuts from the teacher's lounge - to name a few.I gave the book a 3-star rating because I genuinely enjoyed it. Joyce Sidman's word choice and poem topics almost convinced me that the poems had been written by actual students. She had a wonderful way of expressing her insights through the eyes of children. The poems of forgiveness revealed an understanding that many of misbehaviors of children are not intentional or purposefully hurtful. She portrayed forgiveness as a wonderful reality that each of us deserves. I am quite sure that children would enjoy this collection of poems and would readily relate to the experiences of Ms. Merz's class. I really like this book. Ditulis oleh Joyce Sidman, tapi seolah ditulis oleh anak-anak grade 6, yang isinya permintaan maaf. Ada permintaan maaf dari anak ke ibunya, ada yang dari murid ke guru, ada juga dari teman ke teman.Yang unik, buku ini terbagi 2 part. Part 1 berisi puisi permintaan maaf, yang part 2 berisi jawaban dari orang-orang yang mereka mintai maaf. Kalau membaca buku ini, nggak berasa kalau ini buku ditulis oleh seorang dewasa. Seolah anak-anak ini benar-benar real dan mereka menulis puisi dan meminta maaf, kemudian mendapat respon.Ini salah satu puisi yang ditulis oleh Alyssa untuk kakaknya Carrie:The Black SpotThat black spot on your palmIt never goes away.So long agoI can hardly remember,I stabbed you with a pencil.Part of the lead, there,still inside you.And inside me, too,something small and black.Hidden away. I don't know what to call it,the nugget of darkness,that made me stab you. It never goes away.Both marks, still there.Small blackreminders.Dan ini jawaban dari Carrie untuk Alyssa:Roses Are RedRoses are red,Violets are blue.I'm still really,pissed off at you.Si penulis terinspirasi oleh puisi karya William Carlos Williams, yang dipilih untuk dijadikan judul buku ini. Gini puisinya:This Is Just to SayI have eatenthe plumsthat were inthe iceboxand whichyou were probablysavingfor breakfastForgive methey were deliciousso sweetand so cold Ilustrasinya bagus. Inspired by WCW's "This is Just to Say," a fictional class writes and sends a set of apology poems and then receives responses, in poetry, of course.I rather like this faux anthology. It's been done than I expected. Sidman went farther than just lighthearted fair and the book is better for it. This isn't to say it's not fun, because it is. It's just that the variety--of styles, of topics--make it good.This thing has so many uses. Kids will get a kick out of it as well parents. Teachers/Librarians could easily use this for a poetry project. So many ideas! A note on the organization: I'm sure some people don't like how the book was laid out for the poem and its match are not side by side. However, reading the apology ones was quite a thing. There was a rhythm and an emotion created by reading the mass of them together that could not have been replicated by reading the apology and then the forgiveness (but you could try this tack, too.) It fit the "assignment" as well. You have to put yourself out there and wait to see what you get. That said, I had the book open in two places for the forgiveness poems, glancing at the first before reading the second. The book is short so this is no hard task.Quibble: I wish Sidman had made it clear that students did not write these poems. What a neat book! This book was originally written by a class of sixth graders who were working on an assignment to write poems to say you're sorry. It turned out so successful that they turned it into a book. It didn't stop there! In addition, they all got to write responses to the people whom they apologized to. They also had an artistic classmate create all of the illustrations. This is definitely a one-of-a-kind story! I loved how the apologies were sometimes not apologies, but excuses. It reminded so much of how childrens' minds work. It is definitely something funny and lighthearted to share with older elementary students. There are some sincere apologies that maybe some parents need to hear. It was actually pretty touching and I felt badly after reading some of the poems. On the other hand, there are of course some poems that could also give children some insights..that accidents happen! :) I loved seeing the responses. It really shows that writing notes and communicating does wonders! I really like the idea of this book, poems of apology and their responses of forgiveness, but I was distracted by the fact that they were all written by one person. The book jacket makes it seem as if a sixth grade class has written poems of apology to one another and received poems of forgiveness back. This isn't the case, the author has simply used this idea as the framework for her compilation (which was kind of a bummer). I also wished the apology and forgiveness poems were together, with one on each side of the page. As it reads now all of the apology poems and in the from (part 1) and all of the forgiveness poems are in the back (part 2), this makes things harder to follow as you have to flip back and forth to read the pairs of poems. This was a very touching collection of poems. A group of 6th graders wrote poems apologizing to someone. The people that received the poems wrote back. Some of the poems were written by a group effort to fill in the gaps. The poems have a lot of emotion, which make them authentically interesting. The illustrations add to the sweetness of the poems and really fit with the tone. I think this book would be great for introducing poetry to middle school students. It would show them how to write about their life and emotions to create great poems. I would keep this book in my classroom library to inspire students to use poetry as a way to communicate with others and to interact with their own emotions. If I'm biased about this book, it's because it was given to me by good friends who wished us well as we read it together - thank you Rachel, thank you Noel, thank you Greg. And "well" is what we are as we have enjoyed reading it together - the last book of 2012. Sidman's verse (divided between the apologies in the first half followed by the corresponding forgivenesses in the second) and Zagarenski's illustrations are magical, sometimes very touching and always unexpected (especially in the forgiveness in response to the apology! Only one minor complaint (that requires no apology) about this book - I wish that the apology and corresponding forgiveness had been paired in the the book, rather than separated into sections, so that we didn't have to go back and forth. Texas Bluebonnet for the '08-'09 school year. Joyce Sidman creates a classroom where students write poems of apologies in their 6th grade English class. Those people that the poems were directed to write back their responses in poetry form for the second half of the book. I loved the poems! Some of them were quite funny. A delightful children's book based on William Carlos Williams poem, "This Is Just to Say." Williams' poem is itself an apology poem and reads:"I have eatenthe plumsthat were inthe iceboxand whichyou were probablysavingfor breakfastForgive methey were deliciousso sweetand so cold'The book chronicles apology poems from sixth graders, written as part of a poetry unit at their school, and has two parts. The first part consists of apologies, and the second part consists of those who were apologized to writing responses (in poem format). The two poems that broke my heart were written to a student's dog, who had to be put to sleep, and a student's father, who left their family. "It Was Quiet" was dedicated to Einstein, the dog. "It was quiet. No machines beeped. You looked like you were sleeping. Your nose was still wet. Your ears were still silky. But inside, something was crumbling.......Is death ever right?I don't know, but I hated having to choose it. And I hate the quiet in our housewithout you. ""Next Time" was dedicated to the father. "You went away and left me, It's not the first time.......Please, please come back. Don't leave me spinning alone, like a slow, sad tornado. I'm sorry, Daddy. Next time I'll be perfect. "This book is amazing. You won't regret reading or buying it. This book honestly made me cry. The contrasting poems of apologies and forgiveness were beautifully done. Some of those things that the children apologized for tugged at my heart, and the response they were given even more so. Not only does this book show different styles of poetry, it sends a good message to children and adults. You don't really think about the things that children think about until they find the way to say it. For example, one of the poems was about a child apologizing to his brother for being a "weird kid" and the response to it had me sobbing. I used this book to teach a poetry writing unit to 7th graders this past fall. In truth--this book of poems might be one of my favorite collections of poetry. Modeled after William Carlos Williams's poem "This is just to say." this funny and touching book is a wonderful way to introduce poetry in a non-threatening way. I think many students have this conception that poems need to rhyme and be full of flowery and elaborate language. Sideman's poems are about every day moments and emotions we feel both as children and as adults. It inspires the reader to widen their lens past misconceptions of what we can call "poetry" and opens a space for them to create poems of apology and forgiveness of their very own. My favorite poems in this anthology would have to be "To Manga, my hamster" and "What girls want". This is a very interesting poetry book. It is unique because of the format of it. It is not just individual poems, but poems of apology and forgiveness. Each apology has a response of forgiveness even having some poems narrated by animals forgiving their owners. I would use this in a 4th or 5h grade classroom because of the complexity in the format of the book. I liked the style of illustration in this, which in places reminded me of candy for some reason because the colors tended to be very bright, while the style was childlike without being cloying. The concept that this was written as a class project by an imaginary group of sixth graders worked very well, and I liked the idea that there were responses to each apology. The topic choices were very good as well, ranging from the funny (stealing jelly donuts from the teachers lounge) to the heartbreaking (putting a dog to sleep, a father who seems to be a drug addict and suicidal), which did make the poetry highly realistic. The response section was also very good as it had a bunch of honest reactions, from the parent who refuses to write a poem dealing with her son's over perfectionism to the custodian who wrote on behalf of the dog. There was also a deliberate attempt to be as inclusive as possible by including names of "students" from a variety of different backgrounds.The one problem I had with this involved a couple language choices. The sister who refuses to forgive her sister does use the term "pissed off," which isn't a horrible word but is something that I don't think would be permitted in general talk inside a sixth grade classroom. As poetry really does need to be read aloud to be fully experienced, that causes a problem if a teacher wants to use the book in a class discussion of poetry. Still, that's not a massively problematic situation. The other one involved blasphemy, and that one is a problem. The casual use of it was in character for the father writing to his son, but it is a bit insensitive to some religious traditions and is actually a major problem for reading it aloud in class as many denominations would literally regard saying it as a sin. Honestly, without the last problem, this would have gotten five stars. I don't like the concept of censorship, but the word choice does raise issues for a classroom discussion at a late grammar school/early middle school level. Initially I picked this up for Pamela Zagarenski's illustration. I'd read "Red Sings from Treetops: A Year in Colors" and loved her subtle use of color. But the illustration is hardly the main attraction here. The collage element is nice, but otherwise the pictures are simple drawings. Zagarenski's style itself doesn't do a lot for me, but in this case it worked nicely, lending believability to the "this book was made by a buncha kids" factor. They do look like children might've drawn them. Illustration aside though, I loved the poems. They were funny, sweet, and a little heartbreaking. I felt a little cheated when I found out they weren't really written by children (which you can tell about two pages in... these would have to be some really smart, poetic children), but a good book is still a good book. Like Sharon Creech, Joyce Sidman's poems, the dialogue she creates not just between the initial poem and the response poem, but through connections in the entire book, get you thinking about much larger relationships, about an entire classroom or a whole family, and about the kind of history these make-believe people must have with each other. And they easily relate to your own life. Wouldn't it be nice if everyone actually wrote back?One of my favorites, found on page 36, in response to a poem titled "Not Really" wherein Bobby apologies (but not really) for all the mean things he's done to his crush:To BobbyWhat Girls WantGirls want a lion with a great shaggy mane.Girls want a horse, fast and sure.Girls want a coyote that sings with its heart.Girls wants an eagle, soaring through mountains.Girls want a breeze that whispers its name.Girls want a snowfall that makes the world new.Girls want a dog that wags all over.Girls want a cat that purrs to the moon.Girls want a hedgehog that carries its own armor but doesn't always use it.Just to let you know.By Maria. Love this book!!!! It is so full of honest emotions that will hopefully inspire poets everywhere. I can't wait to use it with my fourth grade writers and our writing club. I am excited to see what they create with these poems as models. (2007) This book is so heartfelt. In it, sixth grade students write apology letters to their parents, siblings, friends, and other people/pets. They write their letters as poems, and receive poems in return. It was so interesting to see the replies to each student's letter. I would use this at any grade level, and pick poems that are most beneficial for my class. 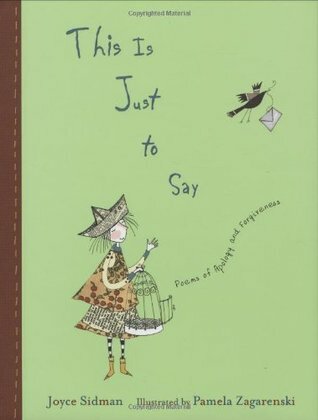 This Is Just to Say by Joyce Sidman is a perfect resource for teaching poetry in the classroom. The book is split into two sections. The first is a collection of poems written as apologies and the second are poems written as forms of forgiveness. The first section of poems originally were produces by a classroom of sixth graders. The intended readers of the apology poems then wrote their own poems as forms of forgiveness. These poems are written in a variety of forms including free verse, haiku, and pantoum. What better way to encourage children to write poetry than show them examples of works written by other children? The authors of the poems use humor, sarcasm, and pointblank honesty to show the vulnerableness of individuals apologizing. This would also be great for introducing classroom morals and addressing the issue of treating others with respect. The illustrations (of the poems not entire book) were done by artistic classmates of the writers and shows how productive a class can be if they are motivated. The skills and communication required to complete a project like this shows the effectiveness of good teaching and also highlights the point that everyone in a classroom is learning adults and children alike. The success of this classroom should be enjoyed by many other classes in hopes of inspiring. “This is Just to Say” is a brilliant collection of apology poems written by a mock 6th grade class. The apologies are followed by a collection of responses to the original poems. The “classroom project” was inspired by William Carlos Williams’ poem This is Just to Say.The illustrations made this book fun and accessible. Most students view poetry as drab, old-people stuff but these illustrations show otherwise. They are funky and use bright colors. Zagarenski said she wanted it to be authentic with what students might doodle on—notebook paper, newspaper, and reinforcement dots. The illustrations are contemporary and resemble what a middle school student might journal. The poems are brilliant. They range from comical to heartbreaking to familiar. The book is very well designed. Each poem uses a different font and format making it very authentic and interesting. The book is believable. This is a great example of a poetry picture book because it uses so many different types of poems. It also shows that poetry can be accessible to younger students and can be fun. It is appropriate for 5th-8th grade. It would be too advanced for younger elementary students. Teachers could use this book to read aloud to their classes throughout the year. They can also have their students research the types of poems used and then create their own class anthology. Joyce Sidman's poems strike a chord in readers by recounting careless words spoken, impulsive acts of theft, unrequited love, disappointing a parent, and getting carried away in sports. The simple language is easy for children to read and its humor and emotional depth is accessible for young and old readers alike. The varying poetry styles such as haiku, rhymes, and two-part poems accentuate the poems' different voices.Pamela Zagarenski's illustrations are a collage of pictures, oftentimes on a background of notebook paper. The pictures and backgrounds are colorful, and the images often look like something a child would draw. The illustrations complement the poems, and the book looks and reads like it is a project from a sixth grade class.I read each apology poem then flipped to the second half of the book to read its response right away. This helped me keep the poems straight in my mind. My only complaint about the book is that it's split into two sections. It would have made more sense for the reader if the apology then response poem were next to each other. The humor and emotional depth in this book of poems touched me. I laughed at times and sat in thoughtful silence other times. Genre: PoetryCopyright: 2007Mrs. Merz’s introduced the poem, This Is Just to Say, by Williams Carlos Williams to her 6th graders, which then inspired students to write sorry poems to their parents, siblings, friends, teachers, and pets. What’s more interesting is that students received response poems from whom they apologized to. Some poems are funny and humorous, while others are very touching, especially the one that a child’s apology poem to her father changed her father’s mind of leaving this world and came back. Though most poems are written in the free-verse fashion, there are few Haiku and Pantoum. This book looks like a class project, which could be a way to teach poems. As students write poems, they would try to explore some details about their feelings, sights, sounds, and smells. Also, language, thinking, and imagination are what students will employ as they use poems as a means for communication. Illustrated by Pamela Zagarenski, who also creates pictures for 2013 Caldecott Honor book, "Sleep Like a Tiger," this could be a book to invite children into the world of poetry.